There's a reason Bubble Bobble is one of only 30 games included on the NES Classic: it's a popular part of the original Nintendo landscape. So it should come as no surprise that a developer, working on Switch, chose the action-platformer as its inspiration. 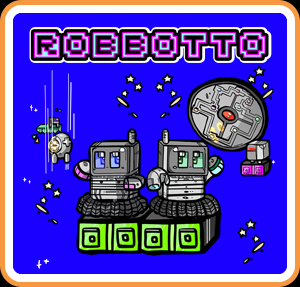 Enter Robbotto, an obvious homage to the arcade classic, which regrettably fails to live up its forebear. While there's some fun to be had in this pixelated platformer, particularly in local co-op, a host of issues — among them difficulty spikes, sub-standard boss fights, clumsy hit detection, and a couple of missing quality of life features — make Robbotto a poor entry on Switch. In Robbotto, two maintenance robots must save a ship full of malfunctioning machines, gone haywire after a magnetic storm scrambled their circuits. As Robb and Otto, players will move across one hundred screens, leaping across platforms and bringing their fellow robots back to normal. It's a good enough premise for an action title, and Robb and Otto are cute protagonists — even as some low-grade pixel art doesn't do them or the game any favors. There are only a few simple commands in Robbotto. Players move left and right with the analog stick or d-pad, jump with B, fire an electrical volley with Y, and spray water with X. It's an accessible control scheme that works well with the game's arcade disposition. Unfortunately, the commands can't be remapped — an issue during hectic boss fights when B, Y, and X must be toggled in quick succession. Those unused shoulder buttons could be helpful here. Complementing the game's simple commands is a straightforward gameplay loop where Robb (and Otto, if you've a friend in tow) enters a chamber, slows a malfunctioning robot with his electrical shot, then disables it with water. Once Robb's job is complete, each powered-down robot will drop a pink gem that earns points toward your high score, and a portal to the next level will appear. Players will repeat this process 100 times, with a mechanical boss appearing every tenth stage. The problems: there just aren't enough ideas in Robbotto to justify 100 stages, its boss battles are nothing special, and there are sudden, frustrating difficulty spikes throughout. The game can feel like a slog at times, in fact. Now, the action-platformer hosts 20 different enemy types, introduced at semi-regular intervals, which add spice to the 100-course meal, alongside a few mechanical novelties, including jump pads, conveyor belts, and — in levels 66-70 — portals that flip the gravitational pull 45 degrees clockwise, but none of the above elevate Robbotto above mediocrity. It's a game that gets worse the deeper in you go, thanks to repetitive gameplay and, worse, technical problems and difficulty spikes. While movement and jumping in Robbotto is fairly tight and responsive, collision and hit detection is a bit wonky. There are moments where the technological twosome of Robb and Otto will collide with platforms or lose a life to a stray bullet when, by the look of things, no contact actually occurred. This niggling issue is made worse by some unexpected and dramatic difficulty spikes, particularly in the final few stages. These problems, along with the aforementioned lack of mappable buttons, reveal themselves most conspicuously during boss fights, sub-par outings with fussy designs, high difficulty, or both. The big exception is the boss battle of level 50, an engaging fight with a snake head that drips poison and a barbed tail that strikes out in vertical lines. The tedium and steep difficulty of Robbotto is less glaring in local co-op, as long as you don't opt for "true" co-op. Here only Robb can launch an electrical attack and only Otto can spray water. It's a far more strategic way to play, but easy it is not. Getting on the same page and attacking in tandem is arguably more challenging than flying solo. With "true" co-op disabled, each robot can deploy both attacks, resulting in a more casual, flexible adventure. Be warned, however: achievements are not counted unless co-op is played the way developer JMJ Interactive intended. Speaking of achievements, they're a huge missed opportunity in Robbotto. You'd think, considering their prominent place on the home menu, that "Achievements" would catalog a long list of special benchmarks and unlikely deeds. Wrong. There are only eight achievements, each unlocked by completing the game's four modes (normal, hard, extreme, boss rush) in solo and "true" co-op. Note that you must complete a solo adventure in its entirely before starting a co-op campaign, and vice versa. The game supports only a single save file, without drop-in/drop-out multiplayer — a frustrating design decision. Presentation-wise, Robbotto is unimpressive. Its simplistic, blocky pixel art looks meek compared to the gorgeous sprite work available elsewhere on Switch, and its static backgrounds fail to impress. The bouncy chiptune music fairs better, but is ultimately forgettable. With Switch earning a reputation as a fertile breeding ground for retro designs and old-fashioned ideas, using it as a platform to emulate an old-school classic like Bubble Bobble was a fine idea in theory. In execution, it fared far worse. While Robbotto offers some quick fun for friends in local co-op and several different modes, its repetitive gameplay, underwhelming bosses, imperfect hit detection, and missing quality-of-life features keep it far removed from the game that inspired it. This review is based on a digital copy of Robbotto for the NS, provided by the publisher.